Where are the adults in the Democrat Party? Do they have any honorable leaders remaining? By now you have likely viewed the video made by James O’Keefe as part of his Project Veritas, in which a Washington D.C. Election Clerk offers a Caucasian undercover conservative activist the opportunity to vote as Eric Holder, the United States Attorney General, who is black. (The same AG who said that in-person voter fraud is not a problem in our country—as apparent justification for his opposition to Voter ID laws.) The video linked shows that the Election Clerk willingly confirms that no ID at all was necessary to vote in that April 3rd primary. The last piece of the film shows the same intrepid Caucasian imposter confirming with guards outside the Department of Justice that indeed a photo ID is required in order to get inside to see someone in the DOJ’s office. O’Keefe’s video offers obvious and irrefutable proof that indeed in-person voter fraud is as easy as pie. You don’t have to show ID, and so as long as you know the name and address of a voter on the rolls, you can show up “identification-less” and be permitted to vote by claiming to be that person on the rolls. Translation: Despite that O’Keefe’s video shows how easy it is to commit voter fraud, we can dismiss it because this time no one actually voted someone else’s ballot. This is exactly the evil which Voter ID laws were designed to eliminate, yet the DOJ’s response, instead of something sane like “we will have to review our decision in light of this event,” is to point out that no cheating actually occurred because this was just a successful undercover sting. Holder’s claim that Voter ID laws are a solution in search of a problem was exposed by O’Keefe’s video for the fantasy that it is. ABC News is now reporting that the District of Columbia Board of Elections has opened an investigation into whether making the O’Keefe video constituted “potential criminal activity,” and has referred the matter to law enforcement. The mental image of Eric Holder the black (and real) Attorney General prosecuting the white (and fake) Eric Holder for voter fraud is almost too much fun. Eric Holder’s purported reasons for challenging the Texas law requiring ID to vote was reportedly that the ID requirement could disenfranchise minority voters. Never mind that Americans including minority voters are required to show a picture ID to get access to bank accounts, to cash checks, to use credit cards and to enter the Justice Department. The notion that somehow obtaining a picture ID is so burdensome that requiring the ID to vote would disenfranchise minority voters does not even pass the smell test. No one thinks that Eric Holder’s DOJ challenged the Texas voter ID law because getting a picture ID is unfairly burdensome. The DOJ (and other Democrat) hysteria about the voter ID law stems from the obvious fact that a voter ID requirement would reduce voter fraud, which fraud the Democrats apparently believe currently helps them win elections. The DOJ’s action empowers and emboldens cheaters. Which leads back to the subject of this story. The DOJ’s “protection of cheaters” approach is the elephant in the room that Mr. Holder does not wish to have you notice or wish to have anyone comment upon. But where are the Democrat Party leaders? 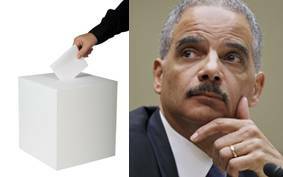 Where are the Democrat men or women of honor who should step up and call Eric Holder’s attack on the Texas Voter ID bill unconscionable and unjustifiable, and who should point out that the claim that the ID requirement unfairly impacts minorities is a farce? Where are the men and women of honor who would speak publicly about the DOJ’s conduct in enabling cheaters by failing to support a simple protection against voter fraud? Holder’s assertion that Voter ID laws are impermissible because they unfairly burden minorities sets up the scenario that leaves those who support requiring ID to vote susceptible to the charge of insensitivity and racism. And that is exactly the reason that Holder chose to take the utterly illogical and indefensible position that voter ID laws are unacceptable because of their impact on minorities. Those who consider speaking up to say that integrity and the basic, common everyday practice of requiring ID are important will cower in fear of being called racist. That is what makes O’Keefe’s video so impactful. Nothing Holder can say will diminish the simple and undeniable truth that in-person voter fraud is child’s play without a requirement to show an ID. Once the public grasps this reality, all of the farcical race baiting and illogical “undue burden” assertions will be exposed for the diversions they are. Some savvy Democrat could make a name for himself or herself by stepping up now to denounce Holder’s conduct in this Voter ID fiasco, if he or she can just muster the honor and courage to do it.